"I'm Popeye. This is pretty much what I do: stand around and look surly like everyone else in this movie. But aren't my cars cool?" Nominees: "A Clockwork Orange" "Fiddler on the Roof" "Last Picture Show" "Nicolas and Alexandria"
First off I just wanted to write about how I am finding myself rather disillusioned with these Oscar winners, and we are only 7 movies into this thing. I think I am more excited about the anticipation of finding out what the next movie is rather than actually enjoying the movie that we are currently watching. Incidentally if no one knew we randomly choose the next movie after finishing one. 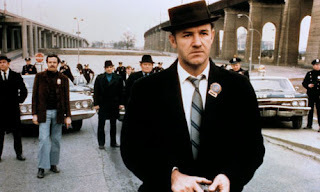 So here we are at The French Connection, a classic old-school Gene Hackman film that I am ashamed to say I haven't actually watched all of before, although I have seen part of the chase under the above ground subway numerous times. In the end I would have preferred not watching it and doing something else for 104 minutes. Wow was this one boring as hell. This has almost next to no dialogue, the dialogue that is present is mostly mumbled so it can be hard to actually know what is being said and thus what is going on. Basically this movie is about a few cops following the drug trade from France by following around the various drug dealers and staking out their hotels and homes and walking/driving around New York City after them. This movie just didn't grab me, and has no grab factor at all. All it comes down to is watching a couple people drive around following other people or walking around New York following people with the occasional running chase scene and of course ending in the classic subway chase. There is the odd moment that something happens outside of this, mainly focusing on Popeye Doyle and his personal life, but that is rather rare. I have no idea how this won best picture, let alone best actor for Gene Hackman. I guess he won for looking angry and frustrated and running, lots and lots of running. Doyle tends to be a bit of a Dirty Harry kind of cop, the smug, take it in his own hands kind of cop with a dash of sexual creepiness. That being said, I think the directing was interesting with some nice long no-cut shots and interesting camera angles, but there just was no story. And the chase scene with the subway really wasn't all that good after actually watching it start to finish and knowing the context of it, perhaps it was interesting for the time but too simplistic, and I have seen better chase scenes filmed in the sixties and seventies so this is nothing to sneeze at. Overall this movie is confusing, hard to follow, and has no real dialogue at all. Kind of the opposite of All About Eve which was all dialogue and no action with women being the focus, this was all action, no dialogue and barely had a woman speak in the movie. I can summarize my feeling of this movie like this: the cops kind of knew what was going on and following the drug dealers to figure out everything, the drug dealers were just there and the audience isn't let in at all, we have no idea what the cops know and we never feel compelled to root for the cops or the dealers. The only other nominee that I have seen is A Clockwork Orange. I didn't really like that movie, but the book is fantastic, and the movie is maybe a bit better than The French Connection. I think The French Connection is pretty close to the bottom, although I would place it just above Oliver! Next up, the fantastic classic The Godfather Part 2. We decided to watch this one even though Shannon hasn't seen The Godfather, because part 2 won best picture so it was supposed to be the best movie of that year and therefore should be a good movie in and of itself as a standalone product. I haven't seen the Godfather movies for quite some time but I do remember liking the second one more than the first and the second one can be enjoyed without having seen the first one, but you might need the context of the first one a bit, but Shannon will be the judge of that. Popeye Doyle is a cop (yes, that's his name) trying to crack a drug ring. The drugs come from France (hence the title). There's a brown cadillac involved, in which the drugs are smuggled to the states. It gets torn apart at the police station, then put back together in record time. There's lots of cars in this movie. I hate movies with lots of cars. Detective work looks boring. Too much standing around in the cold. It's based on a true story. I would've rather seen a documentary. The movie would've been much better if one of the cops (preferably Popeye) had been dirty. I decided this halfway through and kept hoping my dreams would come true right up until the end. All men in 1970's New York look the same. I kept having to ask Kurt "Who is that?" All the cars look the same, too. Did I mention there were a lot of cars? Police chases on foot (of which there were many) are not as exciting as police chases in cars, which aren't very exciting either when they involve the Subway. You'd think they would be, but they are not. PS: "Fiddler"?!? How did "Fiddler on the Roof", one of the greatest musicals of all time, not win??!! Granted, I haven't seen the movie version, but come on!! It's "Fiddler"!! And I forgot about how quickly the put the car back together, it seemed like it took 5 hours to pull apart and a measly half hour to put together and make it look pristine.